I hadn't read the first book - Wrong, but as this book had such great reviews and it was trending thought I'd give this new author a go. It was fabulous! I loved this book! Everly was so fun and endearing and her craziness had me laughing out loud often. She had this quiet vulnerability to her that was just beneath the surface of her outlandish behaviour that made her a unique and bewitching heroine. Everly is a wild spirit with an unfiltered mouth who's always been in love with her brother's best friend Finn. She even attends the college he's a professor at to continue her quest to snag him. While they're at home on holiday break, she meets his ladykiller older brother Sawyer, who offers to drive her back to school. For Sawyer it's lust at first sight, and he uses the car ride to try to wear Everly down to prove that there's another option for her. Everly can't deny that Sawyer's extremely attractive, but she's so blinded by her desire for Finn that she won't even consider that she could possibly be compatible with another man. Enter Sawyer. He matched Everly step for step in being forward. He was her perfect match. I loved him instantly - he was a chaser, he saw her and he didn’t run for the hills at her behaviour towards Finn, but embraced it. He loved her for who she was and appreciated her. That doesn’t mean that he didn’t have his moments of utter stupidity – because he had one of those... but it felt real and genuine and the epilogue in his POV cleared his thoughts on that. I laughed and yes, I even cried. Jana Aston blew me away with this book. 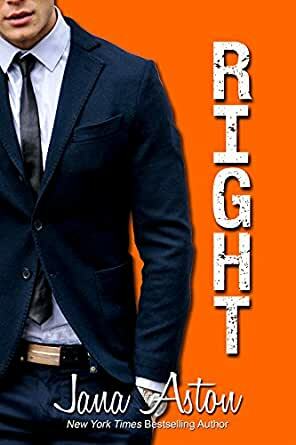 Right puts the ”Com” right back into “RomCom” for me and here is a fabulous 5 Stars for what I think is pretty darn perfect read. I absolutely adored Everly and her gorgeous man Sawyer, and the lovely ensemble cast of friends and family who all contribute to making this an absolute romp of a book. When we meet Everly she has been forced into catching a ride back to school with the older brother of her lifelong crush (and when I say lifelong, I really mean lifelong). Sawyer has seen her coming from a mile away, knows her back story (and what a story it is) and calls her bluff totally which initially throws Everly for a six but makes for a wonderful read as she re-evaluates what she thought was her destiny for her life ahead. Everly might come across as a bit of ditz but she is smart, funny and immensely loyal to her friends and she has the most amazing chutzpah of any character that I have read. Jana Aston has written a gorgeous character in Everly who you would want on your side in a fight but still can navigate the twists and turns of life as long as she has a perfect manicure in an oh-so appropriately named colour and an up to date Pinterest board. I don’t think Jana Aston can do any wrong and this book is just so Right! Trust the reviews. This book is gorgeous. The only reason for 4 stars from me is that I really prefer dual POV throughout the book for my enjoyment. But there's a nice little H epilogue which sheds some insights, and frankly, the h is written with such sass and humour that I almost didn't mind. The H and h are just perfect. The twist shocked me, even though you knew something had to be coming, but if it tellls you anything, there were genuine tears from me for a few pages there. Read this book if you enjoy humour, fast paced, a little heat and a beautiful HEA. Highly recommended and adding this author to my favourites list! 4.0 out of 5 starsALMOST RIGHT! I started 'Right' when it was first released, but have only just completed it. Finn Camden is the target of his best friend's younger sister's obsession...and Everly is crazy-obsessed about Finn! From the time she was a little girl, she spied upon him, dreamt about him, fantasized about him and generally made a pest of herself. As a young woman, she attended the college where Finn lectured in economics, just to be near him. She even formulated a four year plan to nab him. All of her efforts go unrequited as Finn is clearly uninterested. Enter Sawyer, Everly's equal in crazy-stalker-obessive-behaviour. He falls for her big time and accepts her quirky behaviours as adorable. Eventually, their pairing is obviously a match made in heaven and Everly realises that sometimes the 'ideal' guy you've had a forever-crush on, is not the right guy afterall. What I liked about Right was the energetic feel and the humour. Everley's long suffering friend, Chloe was a really likeable character and a positive addition to the narrative. What I didn't like so much was: while Everly's nuttiness was funny, there were times when it became irritating. Further, the plot wasn't always tight and it wandered at times. Right didn't quite work as well as Wrong, but fans of Aston should enjoy it. This was such a hoot. Seriously I haven't had such a good laugh at times Everley made my day. She was so disillusioned with unresiprocated love for her brothers BF Finn that she didn't see what was happening around her. The girl had no filter at times that is until she met her match in Sawyer, Finns older brother. There are quite a few lol moments at her antics. But not everything is perfect as Everley finds out. I felt for her near the end & hoped she'd find her HEA. If you want a good laugh with a feisty h & need an escape for awhile this ones for,you. Everly is definitely an unforgettable character. There is never a dull moment with this girl and there isn't much about this girl and story that I didn't find comical. It's nice seeing Everly got her HEA after chasing a guy (not the hero) for so long. Five stars for a great story and memorable characters!